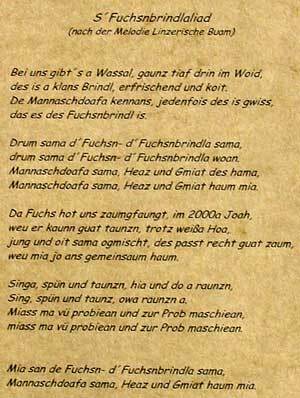 there Nam of us at boss is A fox, mia glaubm - Fuchsenbrindla - fits "
One reaches the Fuchsbruendl in which one straightforward through the nature park "desert" up to parking and there left the three signposts/guides following up to the Bruendl goes. To animate by appearances and darbieten of Austrian and European people dances the old dance culture in our region again. Of course the "Fuchsenbrindla" wants to find to fun and maintenance also with one another. Animal seriously its that we leave to the professionals. 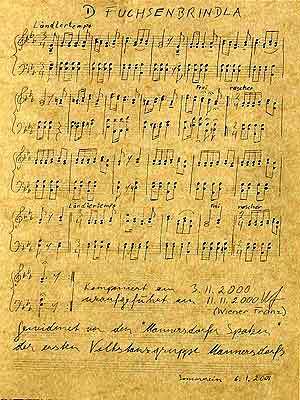 Text of the song "S'Fuchsnbrindlaliad"
Notes of the Laendlers "D'Fuchsenbrindla"